Search for your subwoofer box in our categories on the left side of our website. If you can't find your sub box, contact us. 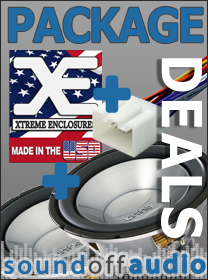 Thank you for your interest in Xtreme Enclosures by Sound Off Audio, we strive to build the best vehicles specific subwoofer enclosures available. I have been in the car stereo and 12 volt industry since I was in 9th grade. My cabinet teacher noticed that I had more interest in precise joints and construction methods than most kids my age. That's where my knowledge base for woodworking began. Once I started building cabinets I just morphed into the local Box Guru. After I graduated high school I worked several jobs until I eventually opened a shop from my home as I worked midnights as a correctional officer for the State of Florida. In 2000 I left that and had built my business up as the primary income for my start up family. EBay was booming and we were selling speaker cabinets that were being drop shipped from a company in TEXAS. Well This supplier went belly up and I told the owner that I think I could go at it on my own. SoundOffAudio.com was born. We are a family run operation, and this is what we do. So we started manufacturing unique applications and making patterns. All with jigsaw and table saw. Well things really started going well for us and we eventually purchased a CNC cutter. That sped things up and allowed us the replicate things more accurately. THIS DOES NOT TAKE AWAY FROM THE QUALITY OF OUR SPEAKER CABINET. THEY ARE NOT PREFAB. Prefab enclosures do not offer the quality control and options we do and are constructed in sweat shops with poor material. We started supplying store with our products. We immediately address several areas of concern that Prefab don't care about. Real life support when you need it.